Karin Hoffman was searching for a place that would allow her to paint while keeping an eye on her two young children. She ended up in her bathroom. Though it may seem like an unconventional location for an art studio, it works well for her. "It's a central space," the Sandy resident said. "There's a sink and a counter, and I can be around for the kids." 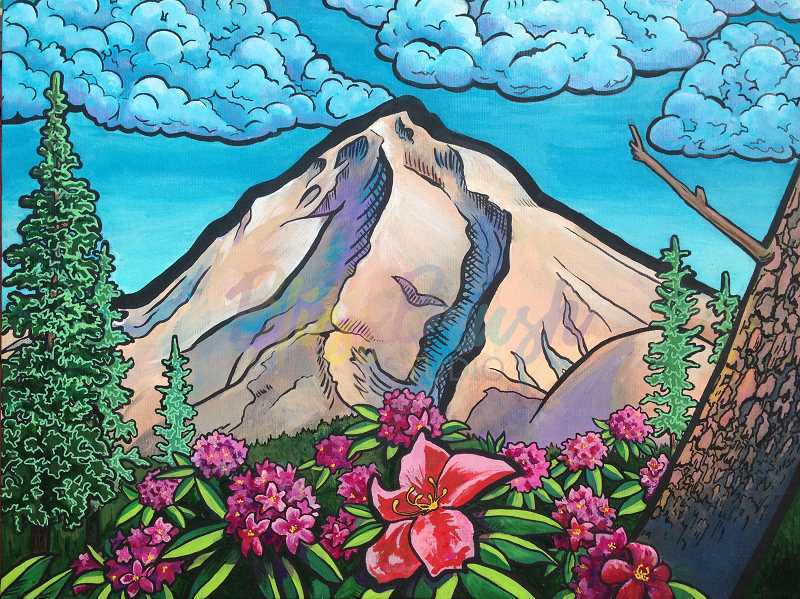 Hoffman, who specializes in acrylic paintings, will have work featured at the Estacada Public Library from Tuesday, Jan. 9, through Wednesday, April 11. A reception for the show will be held at 6:30 p.m. Thursday, Jan. 11, at the Estacada library, 825 N.W. Wade St.
Hoffman described her style as pseudo realistic. "I put my own twists on it," she said. "It's (realistic), but slightly surreal. I like to describe it as bold. I like to use a lot of colors. There's some influence of neotraditional tattoos." Hoffman has enjoyed art since childhood and decided to pursue it as a career to generate additional income. Because her children are young — Brielle is two-and-a-half and Markus is six months — she was limited in terms of job choices, but decided to see if her art could bring in money. "We have school loans from college, and I thought, 'I can paint as a passive income type of thing,'" she said. "I love the creating process. I've always loved being creative, and it's thrilling to me to make something new, or bring new life to something." Hoffman has prints for sale in Cafe Delirium in Gresham and the Moonlight Coffee House & Boutique in Milwaukie. Additionally, her paintings can also be purchased from her website, www.blissbrush.com. Her work has also been featured in the Sandy Public Library, the Oregon City Public Library and the Lake Oswego Public Library. She's looking forward to the showing at the Estacada library. "It's fun to have it out where people can see it," Hoffman said. "Painting is a language of mine to speak life and happiness to people." One of her favorite paintings among the Estacada display is called "Horse of the Rising Sun," which was inspired by a painting of a carousel horse she saw at Goodwill. For her piece, she painted a surreal horse. One of the many reasons Hoffman enjoys painting is because it's a way for her to find peace. "It's nice having it be an outlet for me," she said. "Sometimes there's chaos with the little ones, but I have control over where the paint goes." She also hopes to bring cheer and positivity to others with her work. "I want to combat the dullness of the gray weather," she said. "Bright colors make me happy, and I hope others enjoy them too. I love bringing happiness to people. That's my heart."